You can upload to the server, or temporary change the license that is used in the development client, but you cannot download it again. Usually, that is not a big deal, you got your license file anyway, but in some cases, its practical to be able to export the license. With NAV, the license can be placed in two different places, in the master database or in separate databases. If you check the “Save license in database”, the licens goes into the database, otherwise its stored on the server. 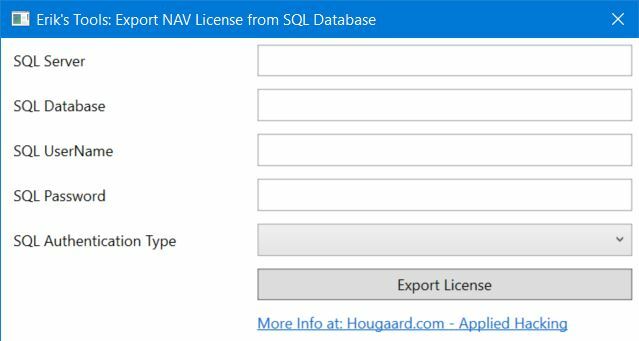 This tools will export the license file from the SQL server and database specified. If you leave the database field empty, the tools will export the license stored in the master database. I tried to run the app it does work when no database is specified as it reads the .flf on the SQL Server. However, when running with a real database, error pops saying “Invalid Column Name ‘License'”. The column name in the database is ‘license’, not ‘License’. Is that the problem? Fixed, try to download again ! Awesome tool, thanks Erik! I lost count of the number of times I did an upgrade and came to the last part of loading the customer’s licence only to realise I don’t have a copy!